Shade gardens are quiet, tranquil places of rest and are often the places where people spend most of their time during the hot summer months. 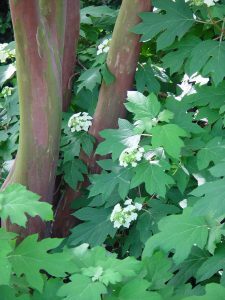 The best way to create a shade garden is to study the shade and sun areas of your yard. Look for the answers to these questions: What portion of the yard is shady? Is it shady all day? Is the shade a deep shade with very little light or is there sun dancing across the area as it filters through trees? Is there any sun during the day? How many hours of sun and even more importantly, what part of the day has the most sun? If you have sun in the morning only, you have one group of plants to choose from, but if your sun shines in the afternoon hours, you can grow a larger range of plants. Remember there are different shade values within the same area. An area under a tree has a deeper shade than the edge of the canopy. A garden under a tree with low branches may be too dark, but if the limbs are trimmed up to allow more light, a broader selection of plants can be grown. Most sun plants will grow well in afternoon shade and many shade plants will thrive with morning sun. Also consider buildings or other structures that create shade. Dry soil conditions and competition from tree roots must be considered, too. Light or Dappled Shade: A good example of this combination of sun and shade is the shade from Honey Locust trees. A variety of shade plants will thrive under this type of shade. Medium Shade: Medium shade has 4 to 6 hours of shade, perhaps areas with south-facing exposures, but with no direct sun. 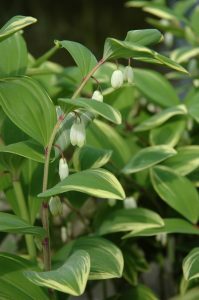 Deep Shade: This is the darkest shade, and one of the most difficult areas for flowering plants. This includes areas under trees with dense foliage with no direct sunlight. Dry Shade/Wet Shade: Different plants will survive in each situation, but few plants will tolerate both. The best solution is to improve dry shade to hold more water, and drain the wet areas of excess water. Bed Preparation: Test your soil for pH and nutrient levels. You can pick up soil testing kits from your county Extension Service office. Three to six inches of compost worked into the top layer of the soil will give your plants a good head start. Areas under trees are the most difficult because tree roots compete with the plants for nutrients and water. Creating raised beds helps, but the tree roots will eventually find their way into your raised beds as well. Design Tips: Plant selection is paramount to shade gardening. – White will be one of the best colors. – Foliage is your greatest asset in shade. – Incorporate annuals, such as impatiens, to dress up drab areas. – Use container plantings to add color. – Use garden ornaments (seating, statues, pottery etc.) to add interest. – Include pathways using mulch, stone, or other materials to provide access. – Use native plants for low maintenance. – Plant daffodil bulbs for early spring color. They naturalize well and are deer proof. – Move houseplants outdoors in summer to add a tropical effect.